A perfect cat, small animal and bird glove. 23 inch Kevlar gauntlet. Having protective equipment that fits properly is absolutely vital to the safety of employees. Knowing how to accurately measure and choose glove sizes can increase safety and productivity in the workplace. Learn how to determine appropriate glove sizes and avoid unnecessary injuries! It is always the employer’s responsibility to his or her employees to assess the risk involved with certain applications. If the employer decides that hand protection is necessary, he or she must then determine the best glove for the specific conditions employees will be working under. Once the type of glove is chosen, you must decide on the size that will best fit. Most of the time employers must choose more than one size to suit various employees. 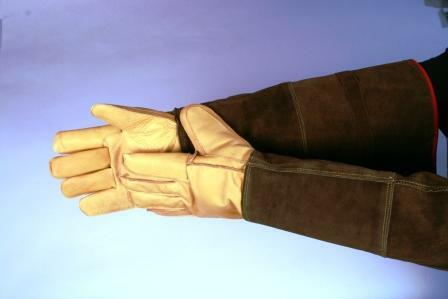 If gloves do not fit properly, it can often delay work or result in hand injuries. If the hand protection is too small, it may cause hand fatigue. If the protective material is stretched out, it is more likely to rip or tear during use which is costly to replace, as well as dangerous for the wearer. Gloves that are too small also decrease dexterity. On the other hand, gloves that are too large also create safety issues, such as getting caught on jagged edges or moving parts of machinery. If the glove is too loose, it could easily be pulled right off the hand, or even pull the wearers hand into moving machinery with it. It is imperative to understand how to appropriately measure the hand in order to get a glove that fits correctly. If the glove fits properly, it will provide the worker with maximum protection without compromising dexterity. To find the appropriate glove size, use a tape measure to measure around the knuckles of the dominant hand. The dominant hand will be the right if you are right-handed and left if you are left-handed. The inch measurement of your hand should correspond directly to the numbered sizes of the glove. For example, if you measure your hand to be 8 inches, you would wear a size 8 glove. If your hand measures over 8 inches it is wise to choose the next size up to avoid hand fatigue or discomfort from a glove that is too small. Some gloves come in lettered sizes such as XS, S, M, L, and XL. These can easily convert to a numerical size for simple selection. See the table for numerical and lettered sizing relation. Taking the small amount of time to correctly measure and choose the appropriate glove size for employees is the only way to provide them with proper hand protection. Gloves that fit properly will help employees stay protected and avoid accidents in the workplace. Please Note: The information above is intended for general information purposes only. It is not a substitute for review of the applicable government regulations and standards, and should not be construed as legal advice or opinion. Readers with specific questions should refer to the cited industry regulation or consult with an attorney.